UK residents can sell personal goods (appliances, furniture, electronics, any goods EXCEPT vehicles) with this Agreement to Sell Personal Property. Once signed, the Agreement becomes a Bill of Sale. The buyer pays a deposit at the time of signing, and the balance of the purchase price at the time of pickup. The seller warrants to the buyer that the personal property being sold does not have any liens, encumbrances, charges, security agreements, or other claims against it. The seller gives no warranty of the working order of the items sold. 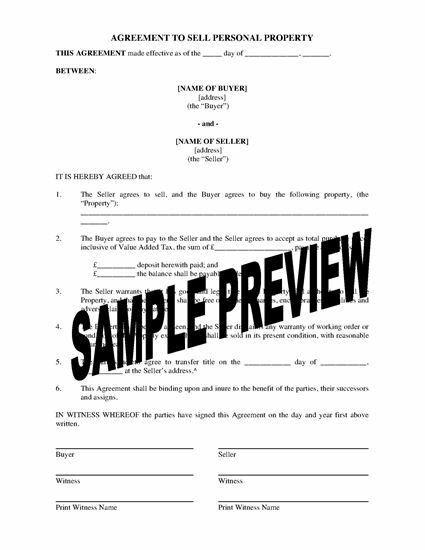 This form of Bill of Sale CANNOT be used to sell a vehicle. The Agreement is governed by English law and can be used throughout the United Kingdom. You can personalize your copy of the UK Agreement to Sell Personal Property to fit your exact needs.